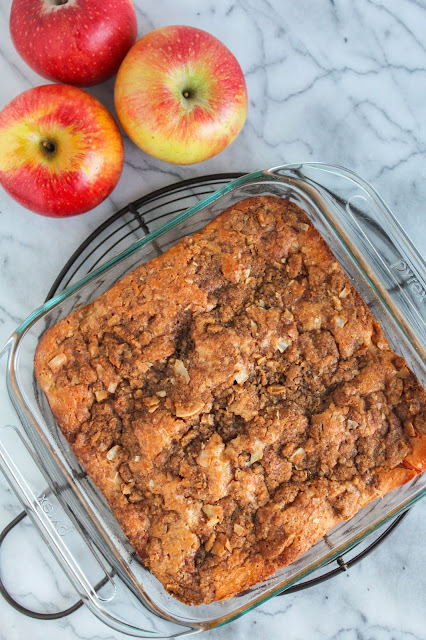 This sweet and delicious coffee cake is loaded with apples and coconut and is perfect for breakfast! I love cake. Pretty much any kind of cake. But I really love a cake that is made for breakfast. I'll admit, I've had a piece of chocolate cake or birthday cake on an occasional morning with a cup of coffee. Admit it, I know you have too! But make a cake specifically for breakfast and I'm ALL over it. Recently I received a box of gorgeous Stemilt Pinata apples and although they taste amazing as is, I couldn't wait to put them in a few recipes. 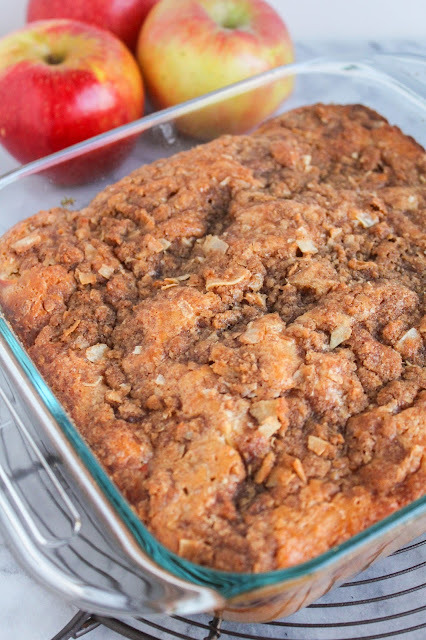 This Apple Coconut Breakfast Cake was the very first thing I made and man was that a good idea! Pinata apples are crisp and juicy and have a tropical taste, which pairs perfectly with the coconut in this cake. 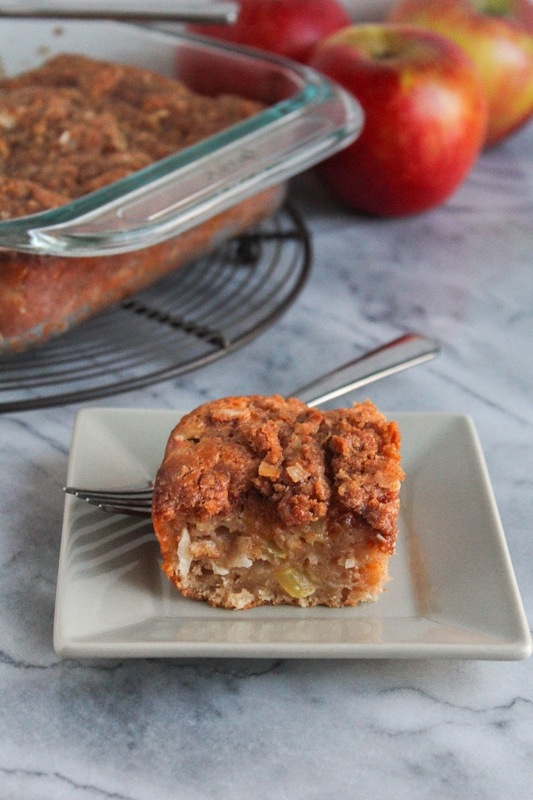 I love that in every single bite of this cake there were bits of apple and coconut throughout. The cake is not overly sweet at all, which makes it perfect for breakfast. It's also great as a dessert with a scoop of vanilla ice cream on the side, just in case you wondered. 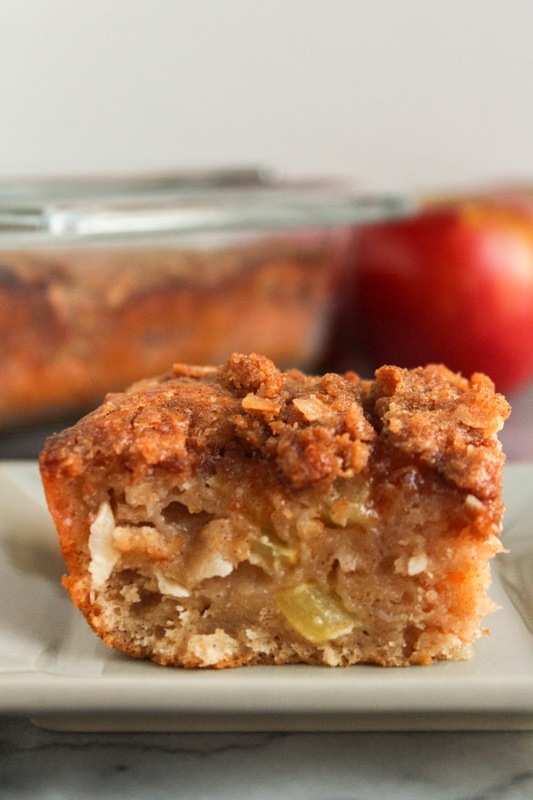 If you love apples, and you love coconut, then you will love this cake. Trust me! Have you tried Pinata apples? Let me know in the comments below! I just can't get enough of them. Preheat the oven to 350 degrees. Spray an 8-inch square baking pan with baking spray and set aside. Combine the flour, sugar, coconut flakes, baking powder, cinnamon and salt in a large bowl and whisk to combine. In a medium bowl, add the yogurt, milk, oil, vanilla and egg and mix well. Add the wet ingredients to the dry, stirring just until moist. Fold in the diced apples. Pour the batter into the prepared pan. To prepare the streusel, mix the brown sugar, coconut, flour and cinnamon in a small bowl. Cut in the butter with a pastry blender or your fingertips until the mixture resembles coarse sand. Sprinkle the streusel evenly over the batter. Bake for 40-45 minutes, or until a cake tester inserted into the center of the cake comes out clean. Allow the cake to cool in the pan for 15 minutes before serving. Serve warm.